The Boonton Model 4500B is the instrument of choice for capturing, displaying, analysing fast and complex RF Signals. 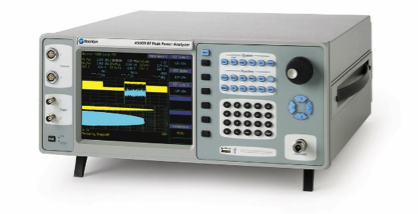 The 4500B Peak Power Analysers provide most accurate measurements even for highly demanding RF measurement requirements. This power meter is taking performance to a new level and changes the way the industry views and analyses RF signal powers. The 4500B features a rise time of less than 5ns, 100 picoseconds time base resolution, video bandwidth greater than 50 MHz, flexible triggering and greater than 80 dB dynamic range – that without the need of range switching. The 4500B also features an optional statistical power analysis package, offering continuous or gated CCDF, CDF or PDF presentations. When numeric information is required, users can choose an individual set of up to 15 different measurements parameters per channel – displayed simultaneously. Furthermore, envelope and persistence views provide fast in-depth signal analysis. 4500B’s I/O capabilities include LAN, GPIB and USB ports for storing data such as instrument setups, trace waveforms and bitmap image files.